Burn video to DVD/ISO/DVD Folder/Blu-ray DVD Easily. Edit videos before DVD creation. Choose and Customize DVD templates. Make photo slideshows to DVD with music. DVDFab is popularly used software for DVD ripping, burning, and decrypting needs. The program has a simple interface, fast burning speed, and comes along with an array of useful and interesting features. 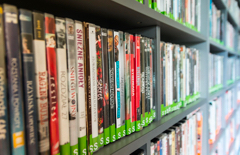 However, there may be reasons like incompatibility with OS, not having required function or the high price that may lead to looking for DVDFab alternatives. There is no dearth of DVD burning software and in the following part, we will discuss the best DVDFab alternative to burn videos to DVD. DVDFab 10 is a widely used DVD ripping program but there are a number of limitations associated with it. Some common reasons to look out for DVDFab alternatives are listed below. DVDFab 9, as well as other software versions, does offer too many DVD menu templates to choose from. Moreover, the customization options are also limited. So in case if you want to choose or personalize your DVD themes, the software offers very basic options. DVDFab 7 and other versions of the program have no option for video editing. Using the software you cannot cut, trim, crop, or add any special effects to the videos before burning them. Thus video personalization is not an option with this tool. DVDFab6 and its other program versions do not support option to add pictures to create photo DVD slideshows. Like other professional software, DVDFab does not have the option to preserve photos of your special moments in form of a disc. If you need to create or add chapters to your DVD disc, DVDFab 7 and other versions are not for you as the feature is not supported. Besides above listed there may be other reasons like OS incompatibility, no support to music files, no-option to set aspect ratio, and lack of additional functions that may force you to search alternatives. A myriad of DVD burning software is available, but making the right selection is important to get the quality conversion with added features. Two best DVDFab 10 alternatives that come loaded with all needed features are Wondershare DVD Creator and Wondershare Video Converter Ultimate. 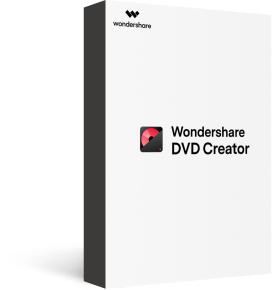 Wondershare DVD Creator is the expert software designed to burn your videos, pictures and audio files to high-quality DVD and Blu-ray discs. The software is fully compatible with Windows 10/8/7/Vista/XP/2003, and Mac OSX 10.6 and later versions. 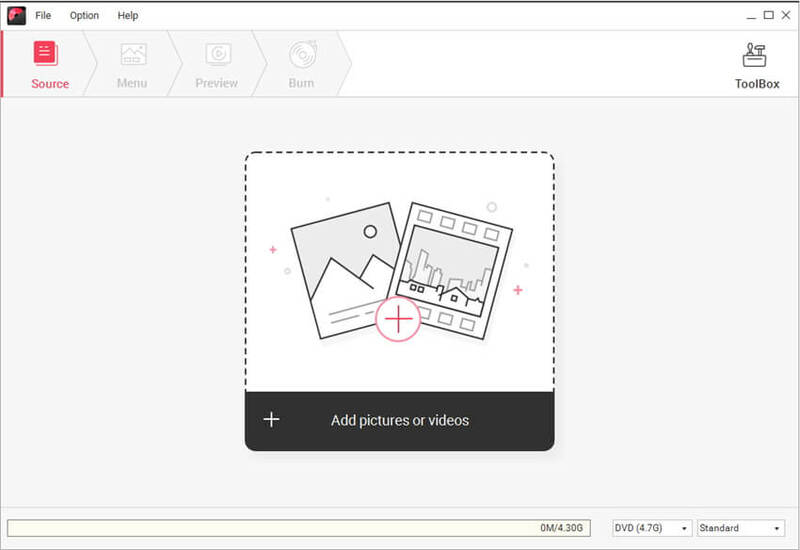 Using the built-in creator of the software you can take your creativity to a whole new level by combining photos, videos, music. No matter whether you have an SD or an HD video or images in any format, DVD Creator support burning them to DVD and Blu-ray discs. 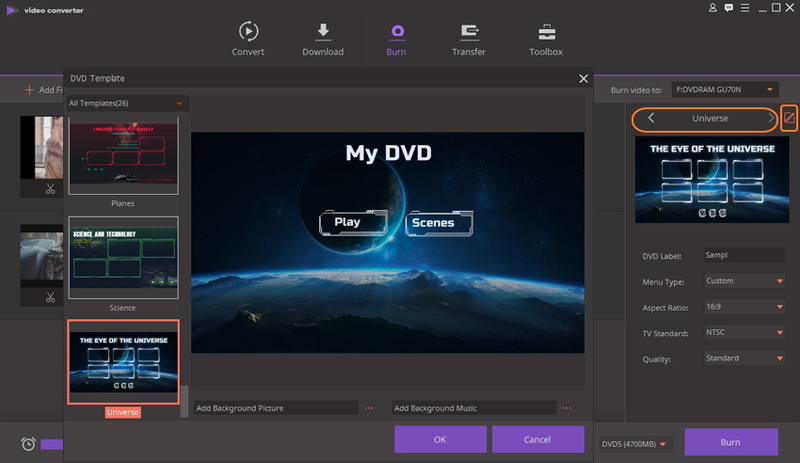 The simple interface helps to create professional looking discs in no time.
. Best alternative to DVDFab to burn video/audio/image files to DVD/Blu-ray Disc/Data Disc/ISO File. · Support most media files formats such as MP4, MP3, MOV, AVI, PNG, JPG, and others. 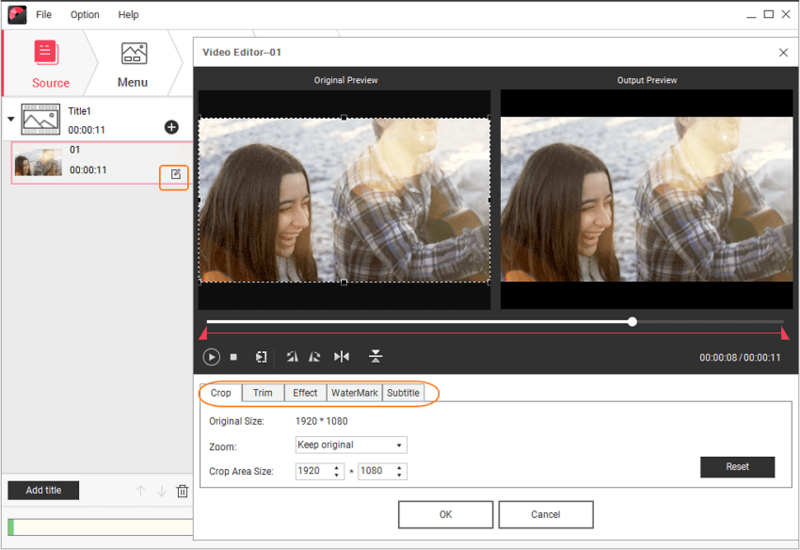 · Build-in video editor to personalize videos by Trim, Crop, Add subtitles, Rotate, frame, etc. · Customize DVD menu with different parameters like background image/music, text, chapters, etc. · Choose from 100+ free DVD menu templates with different themes. · All popular types of recordable discs are supported. · Burn videos to DVD with real-time preview, super fast burning speed, and high-quality output. · Additional functions including burning data disc, burning ISO files to DVD, making DVD copy, converting DVD to video, creating photo slideshow, etc.
. Supported system: Windows 10/8/7/Vista/XP, Mac OS 10.14 (Mojave), 10.13 (High Sierra), 10.12, 10.11, 10.10, 10.9, 10.8, 10.7, 10.6. Step 1 Open DVDFab alternative and choose to create a disc. Download, install and launch the Wondershare software on your PC. Select the Create a DVD Video Disc option. 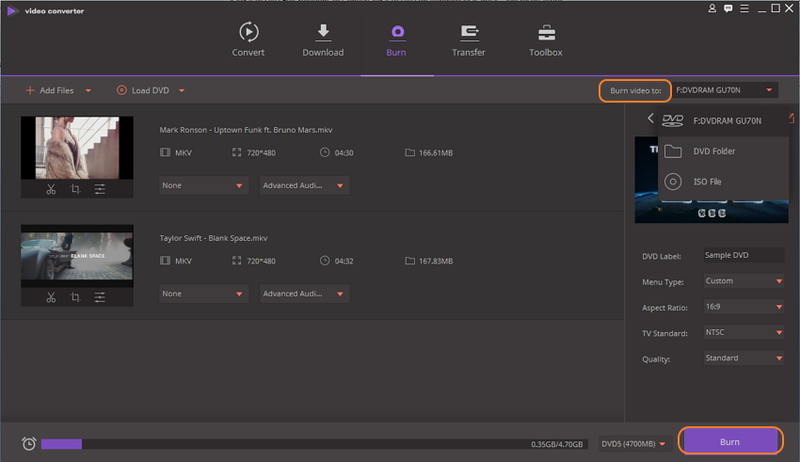 Step 2 Add and edit Media files to DVDFab alternative. Click + button under the Source tab to add the desired media files present on your PC. Multiple files can be added here. For video personalization, click the pencil icon to open the Video Editor window. Make needed changes such as Crop, Trim, Add Effect and click OK to go ahead. Step 3 Customize DVD menu template. Move to the Menu tab from the main software interface, and you can see the Menu Structure and different template options on the screen. You can double click to choose a given template or download more styles by clicking the download icon. To edit background picture or music, add text or chapters on the selected template, click the relevant icons at the top of the interface. Step 4 Burn DVD with DVDFab Alternative. 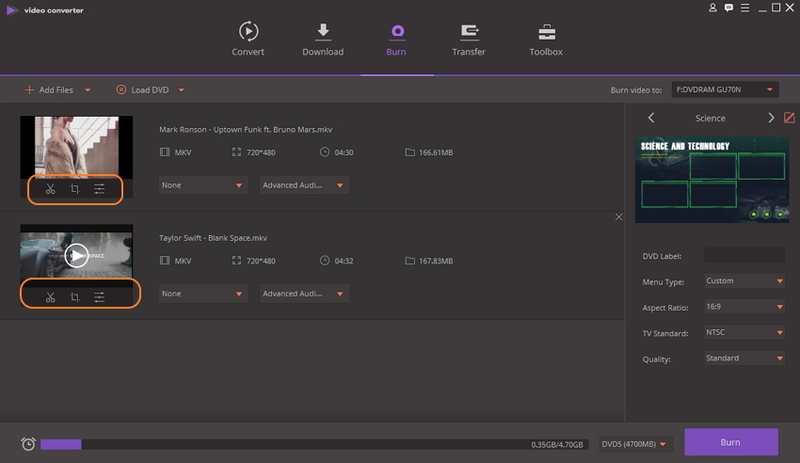 To preview the created disc, move to the Preview tab. If you want to make any change on your design, back to the Source or Menu tab to edit. Next, click the Burn tab and select the Burn to disc option from the Settings window. You'll be asked to enter DVD label and select other parameters. Finally, click Burn to start converting media files to DVD disc. The other software that proves to be an apt alternative to DVDFab 10 is also from Wondershare family- Wondershare Video Converter Ultimate. This excellent program not only burns your media files to DVD but also performs a host of other functions. Using the DVDFab 9 alternaitve, you can convert your media files to over 1000 formats as well as devices. It allows downloading videos from more than 10,000 sites including all popular ones like YouTube, Vimeo, Daily Motion, and others. You can also transfer your videos and other files between Android devices, iOS devices, and external HD as well as USB Flash. Additionally, while transferring files, you do not have to worry about compatibility issues as file conversion to compatible formats is done automatically. Some other features that make Wondershare Video Converter Ultimate is a complete video toolbox include screen recording, videocast to TV, Metadata fixing, and others. • Works as all-in-one DVD toolkit that facilitates to burn videos to DVD disc, Blu-ray disc, DVD folder and ISO files. • Comes with 20+ free DVD menu templates to choose from. • Template customization with features like background music or picture, adjusting DVD title's font, color, and size. 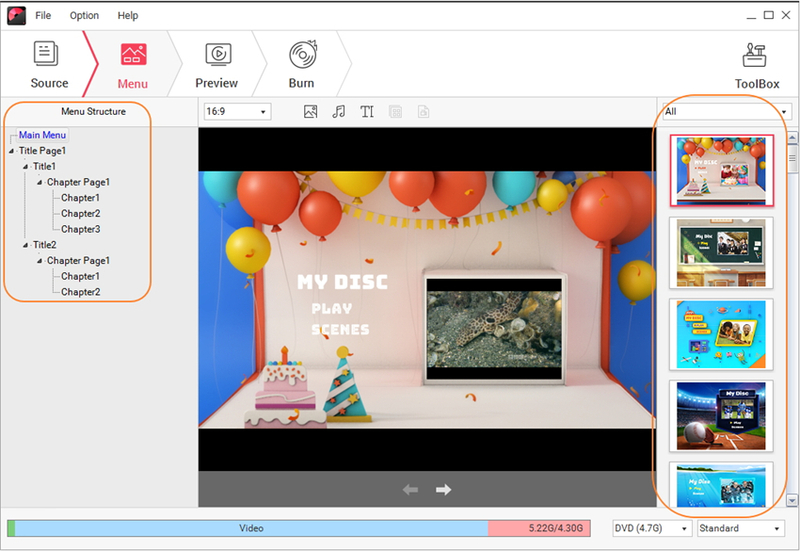 • Built-in video editor allows to rotate, trim, add special effects, crop, and perform other functions before burning videos to a DVD. • Intuitive interface for simple yet fast process along with an option of the real-time preview. Step 1 Open Wondershare DVD converter and load videos. Launch the Wondershare Video Converter Ultimate software on your PC. Go to the Burn tab from the main interface. Click +Add Files to import videos from your PC that you want to burn. If video editing is needed, click the icons under added video thumbnail. A new pop-up window will open from where do the needed changes. Click OK to confirm. Step 2 Select DVD template. The right side of the software interface shows the available DVD themes to choose from. Move the right and the left arrow to check designs. Click the edit icon on the right corner to open DVD Template window. Add background music or picture here if needed. Step 3 Choose DVD label and other parameters. Give a label to the DVD. Choose other disc parameters like Menu Type, Aspect Ratio, TV Standard, and Quality. Step 4 Burn videos to DVD with DVDFab 9 alternative. At the top-right corner, select location where you want to save the burned DVD at Burn video to: tab. Finally, click the Burn button at the bottom right corner to start DVD burning process. So now you have choice between DVDFab 10 and its alternative as discussed in the above part of the article. The selection totally depends upon your requirements and expectations from a DVD converter. To help you with the same, a table comparing DVDFab 10 and its alternatives is given below. Burn videos to Blu-ray disc No, you need to buy another blu-ray DVD burner. So you can either go with DVDFab for Mac or Windows version if you want basic DVD burning functions. But for an expert and professional conversion with all needed functions install Wondershare DVD Creator or Wondershare Video Converter Ultimate.